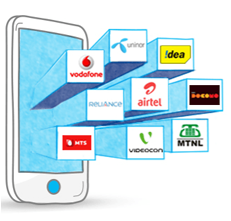 One of the notable services provided by our site is the one where the customers can easily pay their mobile bills or recharge their phones sitting in the comfortable chair at their respective homes. The customers can enter the number they want to recharge or pay the bills for. This will lead to a payment gateway where they can choose the preferred mode of payment and make the payment. Utmost care has been taken to make this whole transaction process the most secure one. Customers can blindly rely on the technology that we use. We promise to make the mobile recharges as easy as ever.